1.Defence of the realm and its people is the first priority of Government, therefore, the UK should remain a nuclear armed power. A submarine launched Trident (or similar replacement) is the best system to meet British requirements. Ultimately, after all other arguments have been exhausted, retention of the independent nuclear deterrent offers the UK the assurance that if all alliances fail this country still has the capability, and will, to deter a nuclear armed foe. 2. Currently the USA, Russia, China, Great Britain and France (the five permanent members of the UN security Council) and Israel, India, Pakistan and North Korea are acknowledged to have nuclear weapons. Iran is known to be actively engaged in acquiring nuclear weapons capability and all states have the technical knowledge if not the aspiration to build them. Therefore, nuclear weapons cannot be uninvented nor can the knowledge of how to make them be expunged from the collective human memory. Non-proliferation treaties have not prevented nations outside the ’Big Five’ from acquiring nuclear weapons or developing the various methods for short and long range delivery. Reductions in warheads through arms limitation treaties, policed through international verification procedures, have had some success in limiting overall numbers but not in preventing individual nations acquiring nuclear weapons. And it is against this background that the retention and upgrade of the UK Nuclear Deterrent must be measured. 3. It is self evident that the effects of a nuclear weapon are devastatingly horrendous and unacceptable to any nation, which is why they have only been used in anger twice, and then, over 6 decades ago, at a time when there was only one nuclear power? However, once the technology was developed outside the USA the aptly named philosophy of Mutually Assured Destruction (MAD) focused the attention of all nations that possessed nuclear weapons. Therefore it can be cogently argued that the reason there has been a Deterrence gap of 66 years since the last and only use of nuclear weapons is because of the very nature of their known effects. (None of which applies to terrorists, whom, if not acting on behalf of a nation state, fall outside the scope of this paper). 4. The UK Nuclear Deterrent & Multi-lateral Disarmament. The UK nuclear deterrent is currently vested in the US ’Trident’ II D5 MIRV system delivered by 4 British built Vanguard class submarines. These replaced the Polaris system in 1994 which in turn replaced the RAF Blue Steel air delivered system circa 1970 – (WE.177 was withdrawn from RAF service in 1998). However, UK has a self imposed limit of 48 warheads for its single at-sea-operational-submarine which is minuscule when measured against the stockpiles of warheads held by Russia (4650 in-use), USA (2626 in-use) and the 22375 warheads that the ‘Federation of American Scientists’ claim were held world-wide in 2010. Therefore, it would be a pointless gesture for UK to offer up part or all of its available 160 nuclear warheads in the cause of ‘Strategic Arms Reductions’ until major reductions have been agreed, primarily by Russia and the USA. 5. Unilateral Nuclear Disarmament. Unilateral nuclear disarmament is a non-starter as many learned academics, statesmen, servicemen and politicians have continually testified, some to this Commission, and retention of the nuclear deterrent in one guise or another has official cross party support in parliament. Therefore, there is little to be gained by re-rehearsing these cogent arguments and stated positions here. Suffice it to repeat the last sentence of the opening paragraph – after all other arguments have been exhausted, retention of the independent nuclear deterrent offers the UK the assurance that if all alliances fail this country still has the capability and will to deter a nuclear armed aggressor. However, the ‘unilateralist’ lobby, who draw to themselves the right to the moral high ground, ignore all this evidence and advice preferring that Great Britain abandon all association with nuclear weapons (and presumably those of our NATO allies – USA and Fance) even as non-NATO states upgrade or acquire their own nuclear weapons. Therefore, as membership of NATO and possession of the independent nuclear deterrent are the acknowledged ultimate guarantors of UK security this unilateralist position must continue to be rejected by Her Majesty’s Government. 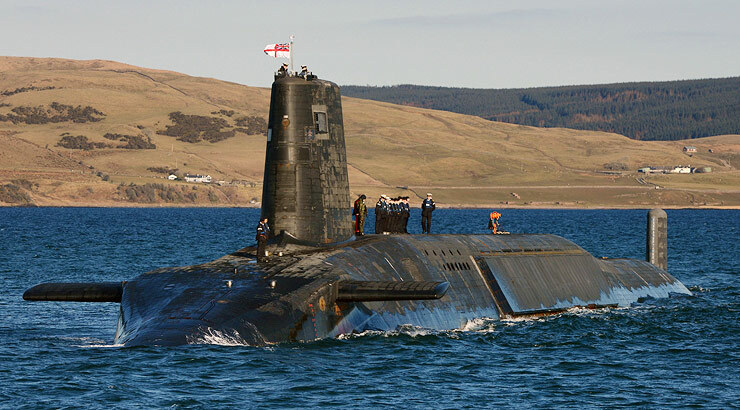 THE UK NUCLEAR DETERRENT RETAINED – WHAT SYSTEM IS REQUIRED? 6. However, the nature of the nuclear weapon moves it beyond normal procurement parameters and puts the decision making process squarely into the hands of the Political elite. Therefore, once the political decision has been made to retain the deterrent, it is a matter for government, in consultation with MOD, to decide upon the most efficient and affordable delivery system to meet the declared objective. (Indeed it is arguable that the nuclear deterrent is not a military weapon at all, but, being a weapon of last resort, to ensure national survival, it is a political weapon that should be funded from central funds – not out of the defence vote.) That having been said, however it is funded, once the decision to have a nuclear deterrent has been taken, the type of delivery system, its required parameters and the geo-political implications must be considered. 7. Where the type of delivery system is critical to the geo-political dynamic is more in relation to its range rather than yield or simple possession. Without the ability to accurately target world-wide locations the weapon system loses its international deterrence/ threat value in favour of regional or local deterrence/threat value. Thus, during the period that a North Korean nuclear weapon system was only able to reach its immediate neighbours the issue, albeit serious for those threatened, was handled primarily by the USA and China. However, the test firing of a longer range rocket system by North Korea changed this balance and the undivided attention of the wider international community has now been assured. Therefore, as the UK is located in the upper latitudes of the Northern hemisphere, surrounded by friendly European nations, the need for a nuclear weapon delivery system that offers global reach is key. A short range system being of little value. Thus, this UK strategic requirement must drive the evaluation as to what system is needed and which branch of the armed forces should operate it. 8. Air Launched System. Currently, none of the RAF’s front line combat aircraft have sufficient endurance to fill this strategic requirement, nor (since the demise of WE.177) is there an air launched nuclear weapon in the UK’s inventory. The RAF aircraft with the longest flight durations are all airliner derivatives, none have an internal bomb bay and they are limited by minimal external hard points and a lack of stealth capability. For a modern air-launched system to be viable, it must be available 24/7, have built-in survivability and, because our weapons are low yield, be able to hit distant targets with complete accuracy and certainty. For these reasons, it is difficult to conceive of an RAF answer to this complex set of parameters without contemplating an extremely expensive and long lead-time aircraft procurement project linked to super-sonic missile technology. 9. Land Launched System Therefore, surface and/or submarine launched missile systems would seem to offer an obvious proven alternative. However, land based silos in the UK were discounted decades ago and would be expensive and problematic to construct. Public opposition to sites near to their homes (the NIMBY effect) would present considerable and possibly insurmountable planning and security issues, becoming not only a magnet for every loony protest group in Europe, but also presenting a fixed target location for an enemy pre-emptive strike. Basing on one of the few remaining overseas territories is most likely to be internationally unacceptable whilst also being a major cost and security problem, requiring a joint garrison for protection and offering a known fixed target for an enemy pre-emptive strike. Which leaves the sea launch option as the front runner. 10 Surface Option. The manifest disadvantages for any surface ship option – even allowing for extensive development costs – is lack of stealth and the inability of surface vessels to travel any distance undetected or unsupported. Therefore, as they are easy to track they are also extremely vulnerable and could not provide the essential certainty and credibility that deterrence requires. 11. Cruise Missiles. The primary constraints with current cruise missile technology are that it is ‘Theatre Level’ and low level sub-sonic. The Tomahawk has a range of circa 1550 miles – compared with a Trident II D5 range in excess of 4600 miles – the former severely restricting the operational firing area whilst improving a belligerent’s ability to detect and counter-strike. As the likely targets are dispersed worldwide the cruise missile range factor will increase the requirement for the number of boats on station to meet immediate global reach. This would escalate costs unless the established concept of operations relating to UK nuclear deterrence is drastically revised. 12. Submarine Launched Trident System. Therefore, the Trident SSBN option must be the front runner given that it is a proven technology that meets all the criteria and for which protocols, training, operational expertise and support are already in-place. The SSBN has proven stealth characteristics which enable it to transit to and from a firing zone without detection and remain on station, unsupported, far longer than any surface vessel or aircraft. Its Trident II D5 missiles have yields of between 10 and 100 kilo-tons and can accurately hit targets world wide. Post-SDSR 2010, 8 missiles and up to 40 independently targeted warheads are authorised by HMG which are more than capable of inflicting such unacceptable damage upon any potential adversary, deterrence is assured. 14. However, deterrence is an integrated system, not simply a missile and warhead but a system requiring many component parts to function independently. Therefore, for the system to be continuous, credible and truly independent an indigenous Anti Submarine Warfare (ASW) capability is required. The Type 23 Frigate, Mine Counter Measure (MCM) craft, helicopters and Long Range Maritime Patrol Aircraft (LRMPA) being integral components of this system – the lack of any one reducing the overall effectiveness. Relying upon allies, however professional and trusted, to provide LRMPA for our deterrent weakens its independent status and is an issue that must be readdressed at the earliest opportunity if indigenous independence is to be assured. 15. Fleet Numbers. Much discussion has taken place about the number of boats required to maintain a 24/7 – 365 day credible deterrent. It has been suggested that 3 SSBN hulls could provide this cover and save money. However, the First sea Lord is on record – supported by many senior MOD personnel and military analysts – as having discounted this option, preferring a 4 boat fleet to ensure maximum cover. The perceived wisdom being that a 3 boat fleet cannot guarantee 365 day cover because it is vulnerable to accident or technical failure generating unforeseen downtime that causes an unacceptable gap in deterrent availability. Given the above and as the savings on a single SSBN new-build would only be in the order of £3-4bn over several years and that the number of deployable warheads is unaffected the 3 boat proposal is not worth the risk it posses? £0.25 billion to participate in U.S. Trident D5 missile life extension programme. £11-14 billion for a class of four new SSBN. £2-3 billion for refurbishing warheads. 17. Finally, prior to the 2010 election some political commentators estimated the total life costs (30 years service) of a replacement Trident system to be in the order of £100bn. This figure does not accord with current estimates which indicate a procurement cost of circa £21bn and through life running costs of circa £45bn based on £1.5bn per year over 30 years – a total of circa £66bn.